The stakes are high for Sony in the delayed launch of the PS3. They may be even higher for its ultra-cool ad agency, says Fortune's Devin Leonard. (Fortune Magazine) -- Turn on your TV this week and you may see a striking commercial: An animated baby doll sits in a white room looking at a small black box. It coos with delight. It laughs with an adult's demented cackle. Tears flow down its cheeks - and back up again. And just for an instant, an image from the PS3 game "Resistance: Fall of Man" flashes in its eyes. Will anybody notice it? Of course they will. The spot is one of the first commercials for the PS3, Sony's next-generation videogame console, whose rabid fans will surely scrutinize it. "We know people will be taping these commercials and freeze-framing them," says Brett Craig, a creative director at the Los Angeles office of TBWA/Chiat/Day, the agency that made the ad. Want more video game news and commentary? Click the professor. To lure gamers, make it a game. TBWA has planted clues about the PS3 in commercials and Web sites. PS3 videos have been posted on YouTube. Sony adopted the "Play Beyond" slogan only after gamers embraced it. No kidding. 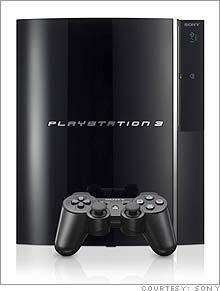 The launch of the PS3 will be one of the most closely watched new-product rollouts of all time. Sony (Charts) is spending $150 million on the ad campaign by TBWA, which has done all the ads in the U.S. for the videogame console since the launch of the first PlayStation in 1995. For the past year it has been working on the ad campaign for the Nov. 17 launch of the third-generation platform - giving the Los Angeles office a chance to demonstrate once again that it is one of the world's coolest creative shops. In early October, Sony and TBWA gave me an advance look at the PS3 ad campaign, which made its debut the week of Oct. 30. The television commercials were still being cleaned up, but provocative billboards had gone up in four major cities, and the agency had begun an intriguing viral campaign that was resonating with hard-core gamers. But coolness can be fleeting, as Sony has learned the hard way. Once, the company's name was synonymous with cutting-edge consumer electronics products. But Sony's image has taken a beating in recent years - along with its stock price. The company has been trounced by Apple (Charts) in portable music players. Rivals like Sharp moved more swiftly to make flat-screen TVs. Sony recently had to recall 9.6 million laptop battery packs it had sold to manufacturers like Dell and Apple because some of them overheated and burst into flames. Its net quarterly profit plunged 94 percent. Sony's PlayStation division has been one of its few bright spots. But Sony may be vulnerable on that front too. The PS3 was supposed to come out last spring, but was delayed in the U.S. and Japan because Sony couldn't manufacture the consoles fast enough. Europeans will have to wait until March. Sony executives say the launch of the PS2 in 2000 had similar problems, but the console went on to sell 106 million units worldwide, becoming the most popular videogame platform on the market. Then again, Sony didn't need a hit new product at the time as desperately as it does today. The company has also taken heat from fans for the PS3's price. A fully loaded unit will sell for $599. Sony executives say the console is worth it. "If it was all about price, then we'd all be driving Hyundais and we'd all be watching $199 TVs," shrugs Jack Tretton, executive vice president of Sony Computer Entertainment America. Still, the high price could be a boon to Sony's chief gaming competitors, Microsoft (Charts) and Nintendo (Charts). Microsoft points out that for the price of the PS3, you could almost buy the most expensive Microsoft Xbox 360 ($399) plus the Nintendo Wii ($249), which hits the stores two days after Sony's new console. That presents a huge challenge for TBWA going into the Christmas season. The goal isn't to sell the PS3 on the first day of the launch - PlayStation fans will probably grab every one of the 400,000 units off the shelves. The agency's job is to persuade those who leave the store empty-handed to wait - to not buy Xbox or Wii - even if it means holding off until after Christmas before Sony can ramp up its manufacturing enough to satisfy the demand. TBWA's reputation is also on the line. Ad agencies are a lot like fashion designers. Marc Jacobs uses his catwalk fare to sell jeans. TBWA/Chiat/Day, a division of Omnicom (Charts), uses the Los Angeles office's showcase work for PlayStation (and Apple, another signature client) to attract clients at its 257 other offices around the world. So the bar is high indeed. If the Los Angeles office doesn't clear it with the PS3 launch, Sony may not be the only client that heads for the exit. Nobody understands that better than Rob Schwartz, who oversees the Los Angeles office's creative staff, a job he compares to managing the 1927 Yankees. 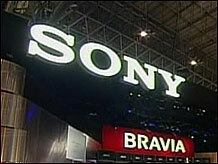 He made sure TBWA pulled out all the stops last January when it met with Sony executives to discuss the PS3 campaign. TBWA rented out the Los Angeles Museum of Contemporary Art for the occasion. Executives from TBWA and Sony spent the morning touring Ecstasy, an exhibition celebrating the sort of visions brought on by hallucinogenic drugs. The field trip wasn't as frivolous as it sounds. TBWA wanted to inspire its art directors and copywriters to come up with something fantastic. After lunch the group retired to the exhibition's centerpiece: a room full of rotating sculptures of giant topsy-turvy psychedelic mushrooms by the artist Cartsen Höller. "Find a genius idea and see if you can ratchet it up a few notches," Schwartz told everybody. The campaign that emerged paid tribute to one the agency created for the original PlayStation launch in 1995. Back then, the agency started with some cultural anthropology. It invited teenage gamers to play the new machine along with the Nintendo 64 and Sega Saturn. They liked the Sony product, but TBWA was concerned: The youngsters were cool and aloof. "Their demeanor said, Keep your distance," an agency executive later recalled. TBWA concluded that the target audience for the PlayStation would be put off by a traditional ad campaign. So it decided to play games with them instead. The agency sent trucks to raves and concerts emblazoned with the slogan "ENOS lives!" ("ENOS" spelled backwards is a phonetic spelling of Sony.) There were living rooms in the trailers where people would kick back and try the new machine. The agency also embedded codes in television spots that fans could use to advance to higher levels in games. But they could be seen only if gamers taped the commercials and went through them frame by frame. The campaign worked: The PlayStation became the No. 1 gaming console in the U.S. Things have changed since then. The generation that grew up with PlayStation isn't passively consuming media anymore; it is creating it through blogs, YouTube, MySpace, and the rest. TBWA especially wanted to make PS3 ads that would get talked about on gaming blogs. "We just want to create something that the audience and the blogs can have a party with," says Schwartz. "We're a little like Gatsby. You know how in "The Great Gatsby," Gatsby had to throw the best party to get people to come? He didn't always go, but everybody had a great time. The point is to put something out there, let people enjoy it, and get out of the way." In May the agency knew it was on the right track when it wrapped the Los Angeles Convention Center with a banner emblazoned with the slogan "Play Beyond" at E3, the videogame industry's biggest convention. Immediately photos of the banner were posted on Flickr, the photo-sharing site. That convinced TBWA to adopt "Play Beyond" as the campaign's official slogan. 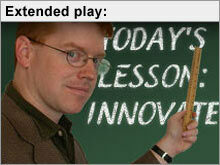 It has since morphed into "Play B3yond." At the same time TBWA was struggling to come up with a central visual image for the campaign. It wanted something that would evoke the PS3, whether it was billboard, a TV spot, a Web site or a print ad. In the spring the agency came up with the idea of a room in which objects would be transformed by the futuristic console. Chairs would bleed. A couch would fly across the room and stick to the wall. The agency wound up simplifying this idea to a white room in which the black console exhibits weird powers, as it does in the TV commercial with the baby doll. Sony loved it. "Good, bad, or indifferent, you are going to have an emotional reaction to that ad," says Kaz Hirai, CEO of Sony Computer Entertainment America. "I want that kind of emotional swelling to be a reflection of what we're trying to accomplish with the PS3." The most intriguing aspect of the campaign is the viral component, aimed at PlayStation's hard-core fans. They have been scouring the Internet for clues about the PS3 for several years. The job of reaching out to them was entrusted to a group of young copywriters and art directors in the Los Angeles office of Tequila, TWBA's online and direct marketing division led by associate creative director Nick Davidge. They decided to lure PlayStation devotees with a secret language. "We wanted to talk to hard-core gamers without anybody else knowing what we were talking about," says Davidge. The group created a Web site, PlayB3yond.com, which went live in early October. Once again the PS3 sat in a white room. But if you clicked around enough, a strange set of symbols appeared. They were based on the ones on the PlayStation's controller. If you pondered them further, you discovered they were an alphabet. There was no explanation. But none was needed. Within 24 hours, a Russian gamer had found clues in the html language of the site and used them to unscramble the alphabet and unlock trailers for PS3 games and interviews with the creators. The cracked code circulated virally. The Web site had 100,000 visitors in its first week. But there was a larger point to the game that TBWA is playing with these fans. On Oct. 24, Tequila unveiled the second phase of the Web site, featuring the first of two explanatory videos about the guts of the machine - the PS3's much-hyped cell processor ("The cell is 40 times more powerful than the processor in the PS2") and the virtues of its Blu-ray HD DVD player. ("It isn't high definition. It's higher definition.") In other words, this is where TBWA and Sony lay out the case for spending $599. The videos seemed more like traditional ads than the Web site's mysterious alphabet. But appearances may be deceiving. "Who's to say we haven't hidden some clues in the videos?" says Davidge. "There are a lot of things that people still haven't discovered on the Web site." Visits to PlayB3yond.com increased by 500 percent in a single day. Gamers recorded the videos and posted them on YouTube and Kotaku, a popular gaming Web site. This all happened before the campaign was officially launched, and it suggests that Sony and TBWA are heading in the right direction. But they aren't declaring victory. There are too many unknowns. They may still have to cut the price drastically for the box to become a mainstream product. There's a spoof of a PS3 billboard circulating on the Internet. The slogan has been changed to "Pay Beyond." In September, Sony cut the price in Japan by 20 percent. No wonder Schwartz sounded nervous over lunch in the TBWA boardroom on Oct. 18. "Sometimes I feel like a character in a videogame," he told me. "You know, like everybody's shooting at me." The three other TBWA executives eating lunch with us laughed knowingly. So did the Sony marketing manager.